July 25, 2013 - "New Product Release"
Coxreels®, leading U.S. manufacturer of industrial-grade hose, cord and cable reels, is pleased to announce the release of their new storage reels selection. These large capacity, all steel, reels are designed to hold any wrappable material for hassle free storage, easy transport, and safe operation. Possessing all the distinctive features demanded by the industry, these models are a helpful solution for storage needs. These new innovative storage reel models have been selected from Coxreels®’ standard 1125, 1175, and 1185 Series and are built on the strength of these series. The reels come without swivels and risers for storage purpose and feature CNC robotically heavy duty spun and ribbed discs with rolled edged for added strength and safety, and a sturdy all welded steel “A” frame base to handle the most demanding storage tasks on either stationary or mobile units. These units have been engineered to store and maintain long lengths of various materials including but not limited to hose, collapsible hose, power cord, cable, rope, wire, barbed wire, tape, and chain. These models are available in numerous lengths and outlet sizes; ready to manage any material that can be wrapped and used in today’s industry. 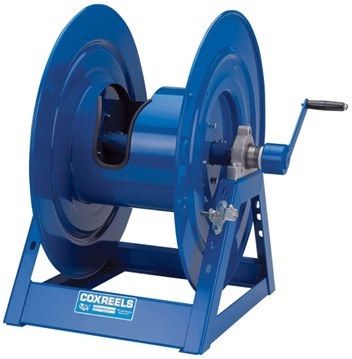 Coxreels has remained steadfast and focused on manufacturing high quality professional grade hose, cord, and cable reels since 1923. Offering a full product line serving the industry in every channel and application, Coxreels takes great pride in designing, building, and supporting all of their products right here in the U.S.A.
For further information on the Coxreels product line, contact Customer Service at (800) 269-7335 or visit www.coxreels.com .